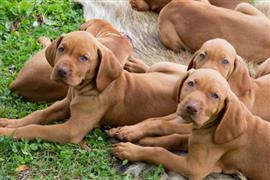 The Vizsla originated in Hungary and it is no surprise that Hungarian names are popular among the breed. Choosing a name can be as easy as jotting down some behaviors and characteristics of your puppy and then looking up related words in Hungarian. A few sample names are Almos (meaning sleepy), Kerge (meaning crazy), and Pajti (meaning pal). Another route to take is to look up names related to the appearance of your puppy. The typical Vizsla coat is a goldish-brown shade that has popularized many color-derived names. A few of the more common options include Copper, Rusty, and Penny. Since the Vizsla makes an excellent pointer, many are bred for sporting and are given hunting related names like Remi, Hunter, and Ruger. Due to their loyal and affectionate nature, the breed is found more and more as a family pet. Borrowing the name of a favorite pet from a book or tv show is an increasingly popular option. Some of our pages will contain a subcategory. A subcategory is a slightly more specific grouping than the main topic of the page. For a subcategory, we will include a separated table of names and corresponding descriptions. An example of a subcategory of Red Dog Names would be 'Dog Names Inspired by Red Wines'. If you have any subcategory ideas for the Vizsla Names page, we would love to hear them. Use the form below to submit your ideas.